Original recipes are one of those things coveted most in marketing. Remember how excited everyone was about Coca-Cola Classic after the New Coke fiasco? Well, sometimes spirits-makers want to get in on that action as well, whether that means a limited-edition release like Beefeater is doing with Burrough's Reserve, or whether it's a complete replacement of the brand's main product, à la Pernod Absinthe. We recently spent some time with both of these new/old products. Here's the skinny. It's Friday afternoon, you've made it through the long week, and it's time for Happy Hour, Gizmodo's weekly booze column. A cocktail shaker full of innovation, science, and alcohol. Everything old is drunk again. When we visited the Beefeater distillery in London last year, we got to spend some time with Desmond Payne, Beefeater's master distiller. With more than 40 years of experience (he was at Plymouth for 25 years before spending the last 18 at Beefeater), you'd be hard-pressed to find a more respected booze-geek in the game. At Beefeater's Kennington distillery, there was one item that always haunted Payne. In the middle of the distilling floor sits "Still Number 12," the original still of James Burroughs, the man who started Beefeater in the 1860s. Still Number 12 is a a small, 268-liter copper beauty. A relic, really, but Payne kept wondering "What if?" Finally, he talked the board into letting him play. The result is Burrough's Reserve, a rare gin that's meant to be sipped neat, not mixed into a cocktail. It's also just about the most analog gin imaginable. All of the botanicals are still weighed on an ancient mechanical scale. While going digital would probably give better accuracy, they are of the opinion that disrupting the traditions they've always used would be more damaging (potentially). Whether it's just superstition or not is up to you. 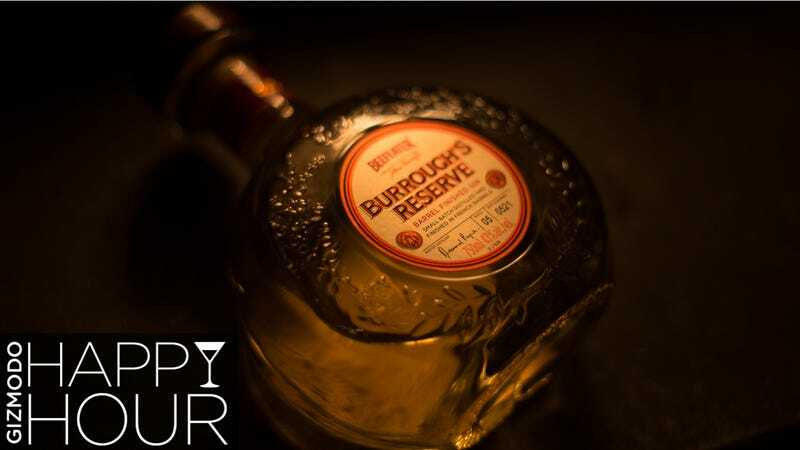 Burrough's Reserve starts off like a standard bottle of Beefeater, using the same neutral grain spirit and the same ratios of botanicals. But then, instead of going through the large system of stills, each batch is made one at a time in Still Number 12. From there, something else unique happens. The spirit is then aged in Jean de Lillet barrels, which are made of French white oak. It's allowed to rest for three weeks before it's taken out, which imparts a light golden hue. Aged gins have been growing in popularity recently, so this isn't new, though we can't think of another that's aged in Lillet casks. Because each batch is so small, the barrels are then blended for consistency of flavor, which is what they do for standard beefeater, too. The result? It's a very smooth gin. It still has all those classic London Dry flavors, but it's slightly mellowed. There's an edge that's been taking off of it, and without the edge, you can taste the botanicals just a bit more clearly. It's really good. Desmond Payne says he intended it to be consumed neat and chilled, but not iced. In other words, it's supposed to a sipping gin. And, y'know, it's pretty damn good! There aren't a lot of gins I'd consider sipping on by themselves, but I could definitely do that with this one. That said, despite Payne's wishes, I'm sure this would make a mean cocktail—just don't mix it with any crappy tonic water. Oh, and good news: Despite the extremely limited run, we're not talking about an expensive bottle. The suggested retail is just $70 for a 750ml bottle, which makes something that's gin-snob quality accessible to the masses (unlike our new favorite tequila). If you can find it. It was just recently released to a number of bars and specialty liquor stores. If you spot it someone, be a mensch and tell us where. So, while absinthe got its start as a sort of French moonshine, the first commercially-produced and sold absinthe was made by Henri-Louis Pernod way back in 1805. By the end of the 1800s, absinthe had become super-popular. In fact, it became customary to sip absinthe cocktails in the hour just before dusk, which became known as the "Green Hour." This was cutting into wine sales, which pissed off the French wine lobby. In the early 1900s, that lobby launched an incredibly effective smear campaign against absinthe, linking it to insanity, hallucinations, and all other sorts of other bad stuff. It was, incidentally, a crock of horseshit, but it worked, and by 1915 absinthe was banned across the U.S. and Europe. So it would remain until 2007, when the FDA finally realized that absinthe is (and always was) as safe for human consumption as any other spirit. Anyway, during the ban, Pernod did not sell absinthe in the U.S. They did sell an anisette (which had a somewhat similar flavor profile, but lacked the wormwood), but it wasn't the same. When Pernod started selling its actual absinthe again in the U.S., it had changed a lot from its original recipe. And while its reception was okay, people felt that it wasn't the "original Absinthe" Pernod claimed it was. As of this month, though, Pernod is going back to basics. The biggest difference you'll notice in the new "Original Recipe" versus the previous incarnation (jeez, that's going to get confusing), is that the new version uses a neutral wine spirit, instead of the neutral grain spirit. The original manuscript that featured Pernod's original recipe noted that the grapes were sourced from Region 5 "Languedoc" in the south of France. The grape-based spirit gives it a rounder, smoother mouthfeel, and for want of a better word, it tastes a bit "cleaner." It kind of gets out of the way of the other botanicals which absinthe is known for. Speaking of botanicals, the previous version of Pernod's Absinthe used wormwood that the company bought from elsewhere. This is significant, because the flavors and aromas of wormwood can vary significantly from region to region. For the new "Original Recipe" version, Pernod will be cultivating its own woomwood in Pontarlier, France, which is where the original Pernod factory was founded in 1805, and is thus where the wormwood would have almost definitely come from. Lastly, the last generation of Pernod used artificial-coloring to make it appear more green. Naturally, people didn't like this. The original recipe called for the green coloring to come from chlorophyll-rich botanicals, though what exactly those botanicals were was never specified. For the new "original" Pernod is using macerated green nettles, so it's au naturale. The big news here is that a) It's a definite improvement over something that was already pretty good, and b) the previous iteration of Pernod Absinthe is being completely phased-out and will be entirely replaced by the "Original Recipe" version. Although nobody seems to be sad to see the old one go, I'm sure someone out there absolutely loved the old stuff and will be trying to buy up the last of it. The price (around $70) and proof (136 proof or 68-percent ABV) will remind the same, and bottles are already being subbed in across the country. Keep an eye out for the words "Original Recipe" on the label. It's interesting to see both of these companies to look to the past for guidance on how to best move into the future. Obviously, both spirits are brand-new, so whether they will be a success or not, only time will tell. For our part, Burrough's Reserve couldn't replace standard Beefeater (or even Beefeater 24), but it's a delightful variation. And, as for the Pernod, we can't wait to work it in to some of our favorite cocktails.